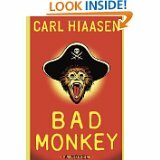 When a male friend suggested I read a book by Carl Hiaasen entitled Bad Monkey I was somewhat reluctant. Scanning the premise on the book jacket, it sounded like guy story. Hiaasen resides in Florida and has written a number of books located in various southern cities including Key West and Miami. As I began reading I became increasingly concerned that I was getting into a Miami Vice-type story but I was urged to push on and I’m sooooo glad I did. Bad Monkey is a well-crafted, excellently-written, funny story about a low-ranking police detective who suspects the discovery of a human arm on the end of a tourist’s fishing line is a potential crime rather than a simple and unfortunate shark attack. The story includes dozens of colourful characters whose lives intertwine in surprising and interesting ways. While the monkey has a rather minor role he is part of a common thread that pulls everything together and he really is nasty. In fact, I enjoyed the book so much I’m going to read more by this author. Fun, fast read. And I didn’t even have to buy it. I downloaded it from the library. Bonus. Hi Lynda, born just before you, I too have seen many changes in my life. Wonder whether our children will see as many. I write a blog about the South Wales Valleys. Hope you enjoy blogging too. http://meg-dragon@blogspot.com.